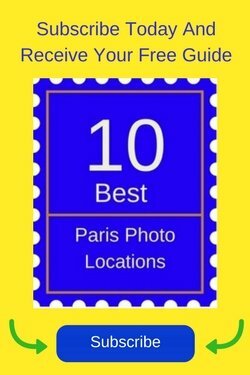 Paris is considered one of the top fashion capitals of the world and in this city, major designers such as Dior, Chanel, Hermes, and Christian Louboutin have reigned for years. Their logos and designs are world famous and adorn millions of bags, fashions, and jewelry. 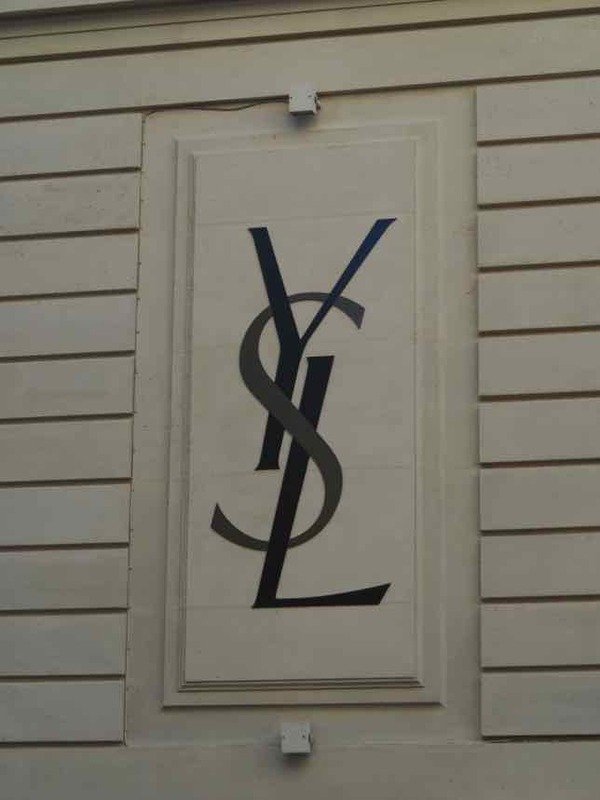 One of the most recognizable is the iconic YSL monogram—-of Yves Saint Laurent. 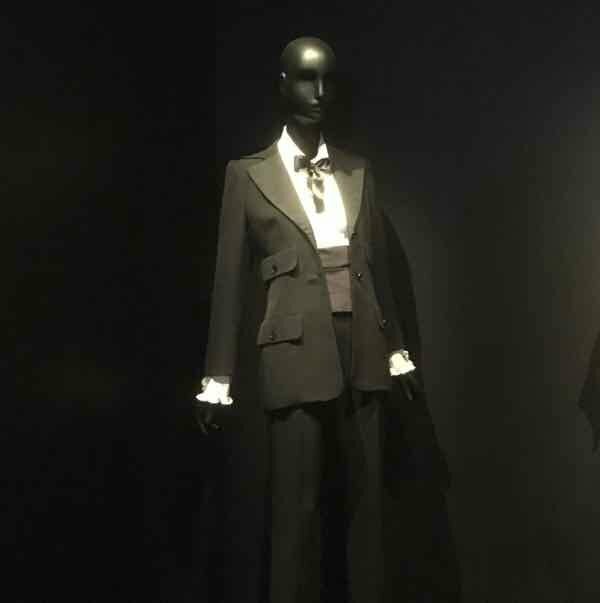 In early October 2017, the Musée Yves Saint Laurent was unveiled in Paris. 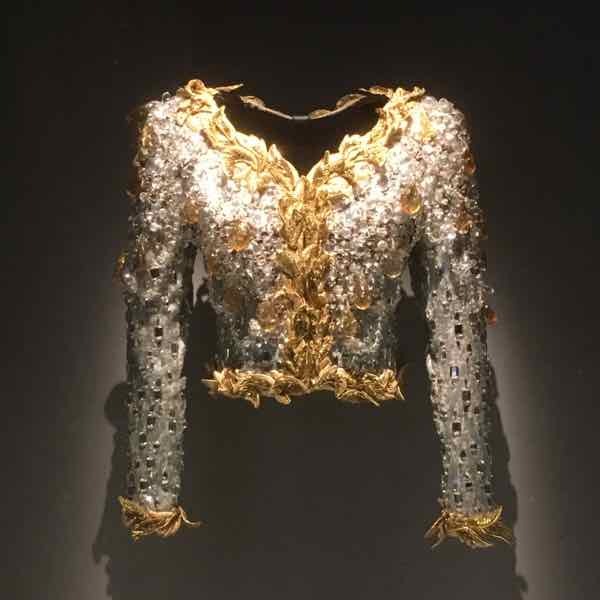 It is located at the original haute couture house where the fashion legend spent many years (1974-2002) designing and creating his collections. It’s worth a visit to this museum as his designs bring back memories of celebrities who wore his clothes during the 60s, 70s, and 80s. The museum is designed with a subdued, yet unique style, much like Saint Laurent himself. I have always admired the work of Yves Saint Laurent. 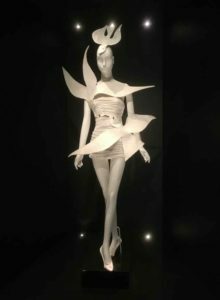 Up until recently one could only see his collections if there was a fashion show or a special exhibition like the one I saw at Le Petit Palace back in 2010. 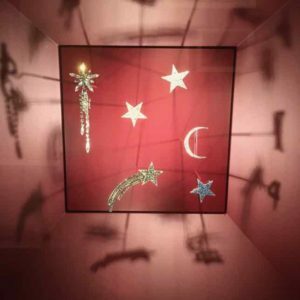 Finally, a permanent retrospective of his work is now housed in a museum that is part of the Fondation Pierre Berge-Yves Saint Laurent Building. the grand iconic YSL monogram on one side of the building and a photo of Saint Laurent on the other side that is one of the most popular black and white photos of Saint Laurent, photographed by Jeanloup Sieff in 1971. 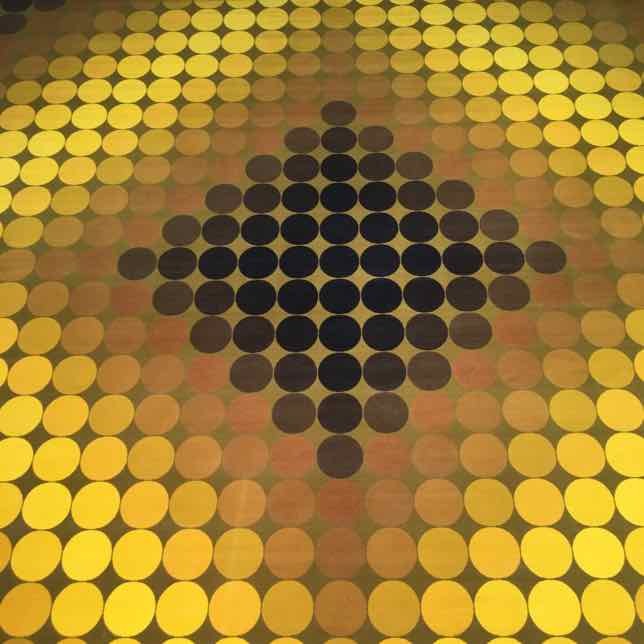 The famous couture house logo (first photo) was designed in 1961 by Adolphe Jean Marie Mouron. 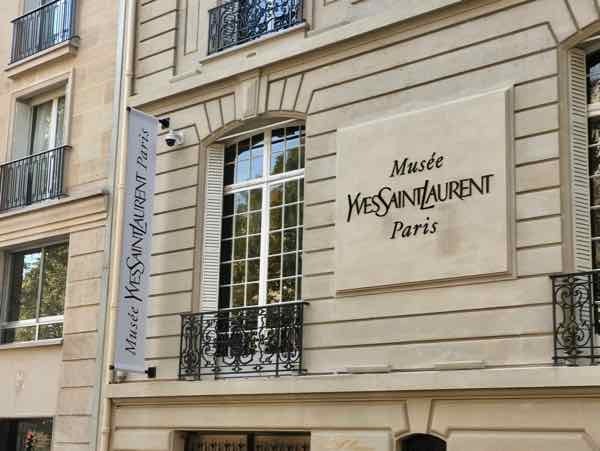 Today you’ll see the Yves Saint Laurent monogram on the museum signage, YSL bags, ties, and other accessories and it continues to be one of the most successful luxury brands in the world. 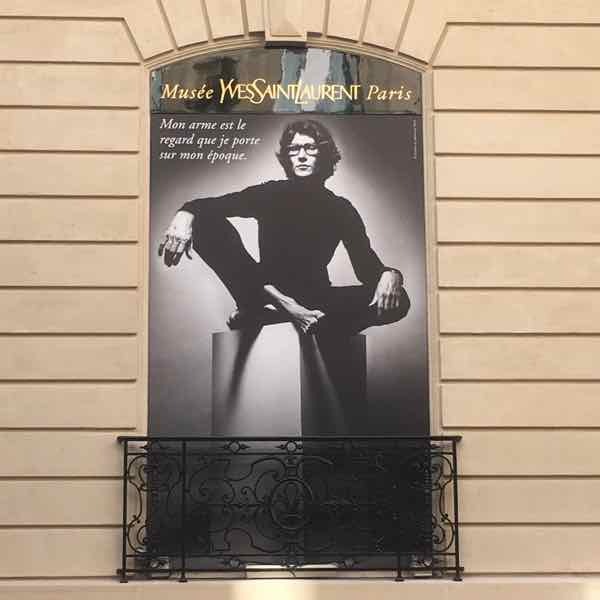 The Musée Yves Saint Laurent website has an excellent biography about Saint-Laurent, so the following is a quick overview. Yves Saint Laurent was born in Oran, Algeria, on August 1, 1936 and in the beginning he wrote poems and designed costumes for the theatre. 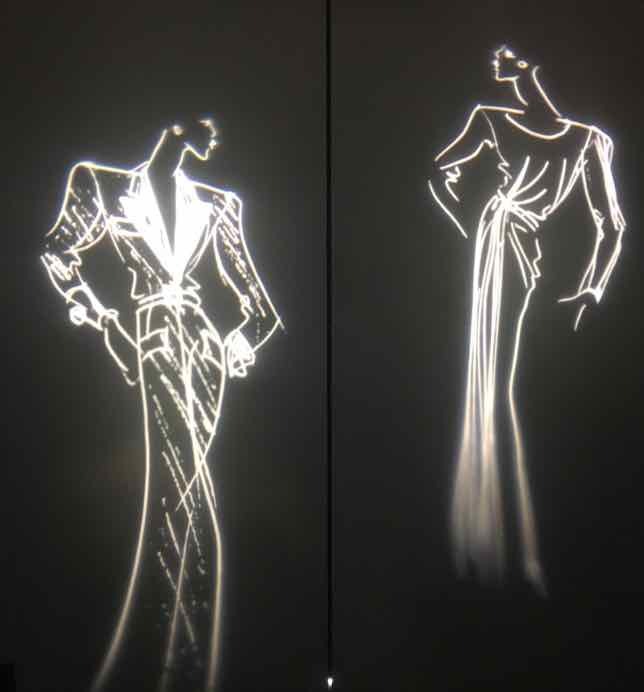 In the early 1950s, he used the silhouettes of the models in his mother’s fashion magazines (ie Vogue) and the fabric from some of his mothers dresses to create outfits for them. They were to be placed on the set of the mini theatre that he had created. Saint Laurent headed to Paris in 1953 to pick up his prize (3rd place in the dress category) in the Secrétariat international de la laine contest. The next year he moved to Paris and won first place in the same contest, again in the dress category and soon after he was hired as Christian Dior’s assistant. In the 1950s Saint Laurent continued to design costumes for the theatre and balls and eventually became Dior’s successor when Dior died in 1957. In early 1958 he met Pierre Bergé who would become his longterm partner until Saint-Laurent’s death in 2008. The ready-to-wear phenomenon of the mid ‘60s was created by Saint Laurent who wanted to design and sell clothes for the every day woman, not just those who could afford to buy haute couture. 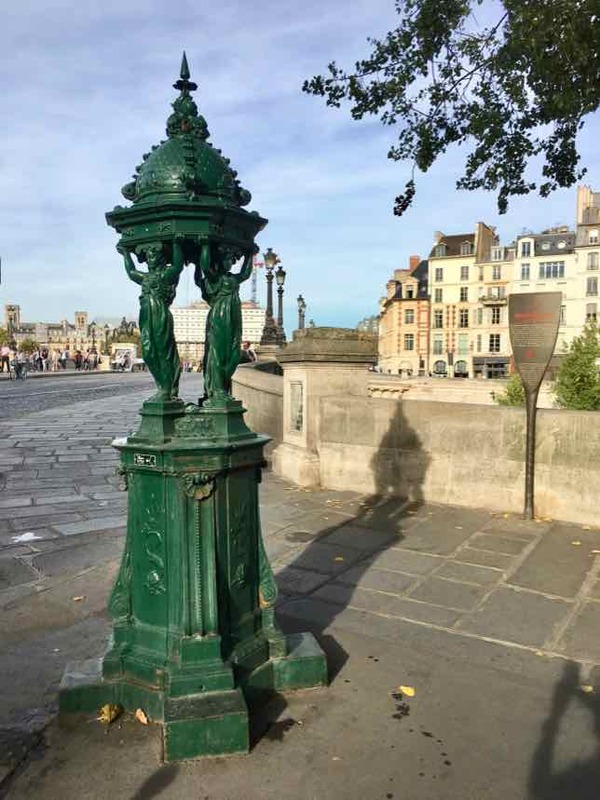 Soon boutiques started appearing in Paris, New York, and London. In 2002 Yves Saint Laurent retired from the fashion industry and in October of that year the fashion house closed. He died at the age of 71 in 2008. 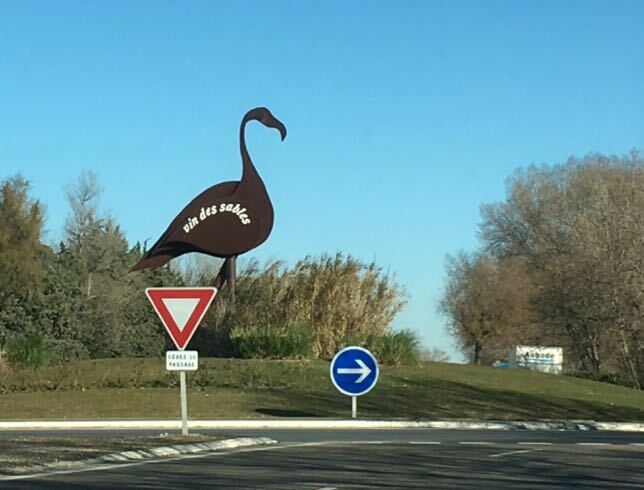 Bergé died one month before the museum opened, in September 2017. Visitors are presented with a retrospective of Saint Laurent’s work in this small but beautifully designed museum. 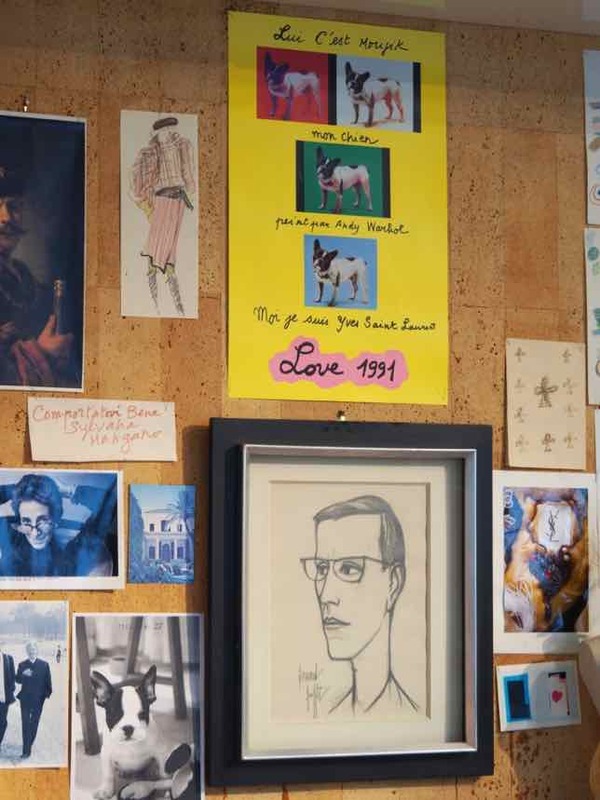 Sketches, designs, and photographs are laid out next to many of the clothes he created. 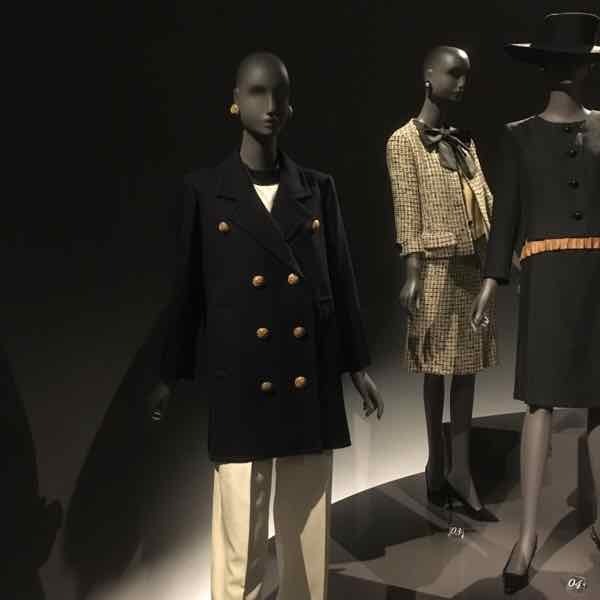 His womenswear designs had a menswear look and this was most evident with his famous pea jacket, created for women in 1962. It presented women with a relaxed chic style. 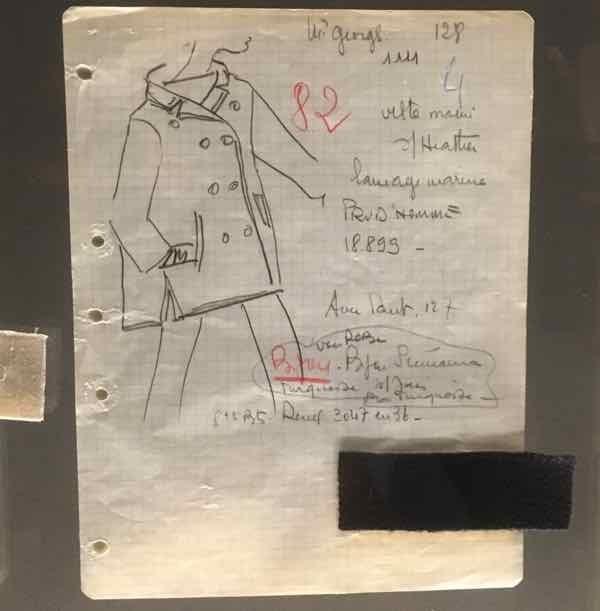 The influence of menswear continued with his design of a trench coat, the tuxedo jacket (“le smoking tuxedo”), safari jacket, and pant suit, all designed with a female silhouette in mind. 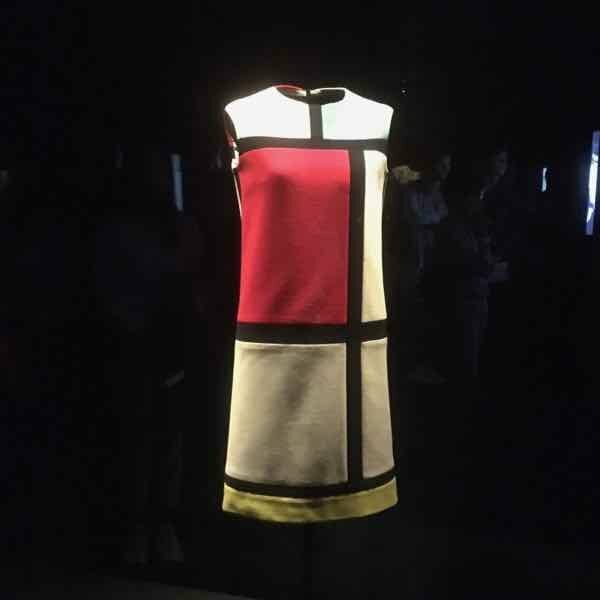 Saint Laurent loved art and in 1965 the couturier incorporated the geometric designs of Piet Mondrian into a dress that would be forever associated with Saint Laurent. 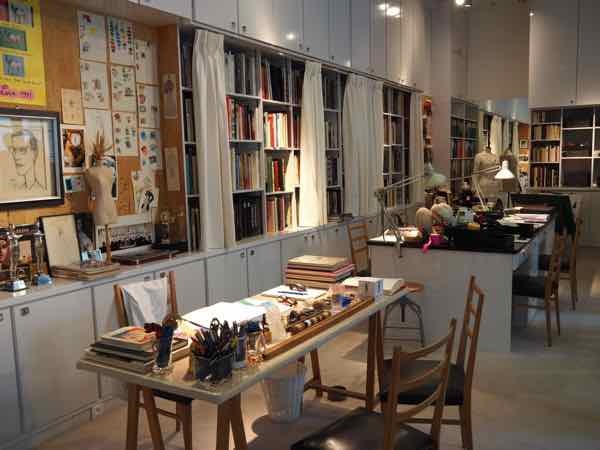 One of my favourite sections of the museums was the recreated studio, or atelier. 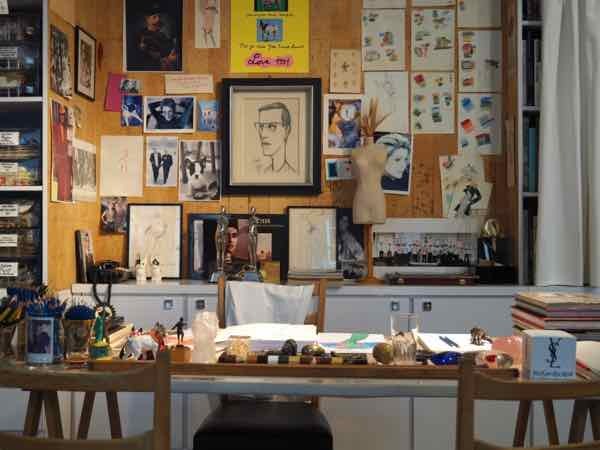 Fabric swatches, accessories, sketches, and designs are laid out as if Saint Laurent had just been in the room. There is a film showcasing his personal and professional life and it’s very good; however, visitors had to line up to get into the small room and the line went up and around the staircase. As I said, the museum is small, so space to line up is minimal. 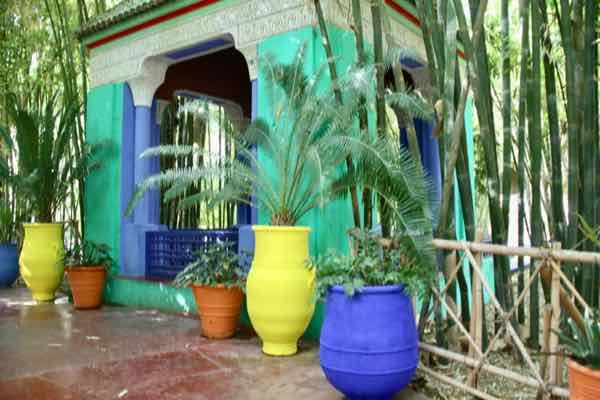 If you ever make to Marrekesh, Morocco, be sure to visit the other Saint-Laurent museum as well as Jardin Majorelle, the property that Saint Laurent and Bergé purchased in the 1980s. They renovated it and today one can visit the villa and gardens. 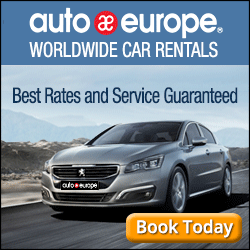 Buy your ticket online, in advance. While you will have to line up, you are given an entry time and your wait won’t be long. 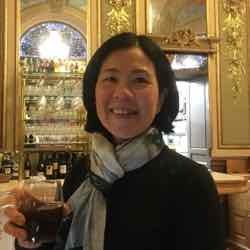 I used to wear YSL shirts back in the day and they were great!